One of the nicest things about traveling by campervan is discovering little-used side roads that take you in the ‘heart’ of a place. We recently had one such experience as we drove from Wellington to Napier. We weren’t in a rush (the best way to enjoy a campervan adventure), so we thought we’d detour and visit the town of Martinborough and the coastal village of Lake Ferry. 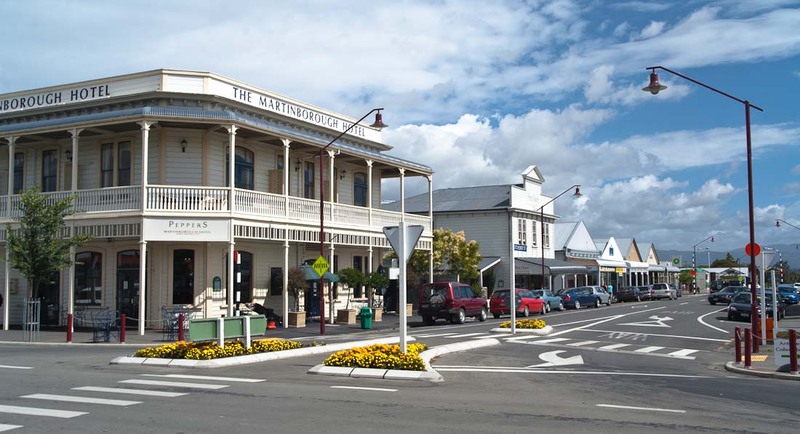 Martinborough is a quaint town full of good restaurants, gourmet food producers, antiques, quality accommodation, an excellent campground, and wine . . . lots of wine. I like to make full use of my on-board kitchen, so I took to the street to find some tasty local delicacies that I could use for lunch. I didn’t have to look far. We were re-fuelling the van, when I spotted local food store Providore nearby. It turns out it was the perfect place to start my food exploration of Martinborough. The freshly prepared food selection was almost intimidating in it’s range, but I managed to struggle through! After buying some fresh scones, marinated olives, delicious local cheese and crusty bread, I headed to the Martinborough Wine Centre to find out a bit more about the local drop. The staff were extremely helpful. They gave me a quick run-down on what was produced locally, how it was grown, and their best tips on choosing the right wine for my food choices. After enjoying a free wine tasting session (yes, free) I made my selections and headed back to the van where my husband was keen to check out my purchases. With our stomachs rumbling, we turned onto Lake Ferry Road and headed toward the wild, wonderful coast near Lake Onoke. If you’ve never visited this part of the Wairarapa Coast, it’s well worth the trip. Brisk sea air, remote untouched beaches and views that stretch on forever are a few of the highlights. And did I mention the traffic? Or rather, the complete lack of vehicles? If you’re from one of the more densely populated areas of the country, or visiting form a city from overseas, the Wairarapa is truly a breath of fresh air. It didn’t take us long to find a ‘pull-out’ perfect for a mid-afternoon picnic. With the sun shining, a gourmet selection of goodies to eat, and seemingly no one else for miles, we had to keep reminding ourselves that we were only one hour from Wellington. Funnily, we were commenting on how we hadn’t seen another vehicle for over an hour when a Toyota Hilux pulled in beside us. In the truck were a couple of locals on their way to do a bit of fishing near the lake outlet. My husband (also a keen fisherman) and the men soon began exchanging stories about their favourite fishing spots. As often happens, the exchange led to an invitation to join the men later at the Lake Ferry Hotel. Evidently the hotel makes some of the best fish and chips in the country. I was sold. So, with out bellies full, a lovely beach beckoning, and the prospect of catching a kahawai, we headed to the road end at Lake Ferry. With a couple of hours before sunset, Steve headed out to join the men on their kawahai quest and I decided to beach comb and take a few photos. It’s incredible how fast time passes in beautiful, serene places . . . so different from sitting at a desk! As the sun set, I was rejoined by my husband and the two fishermen (unfortunately, fish-less) who both, it turned out, were New Zealand wine enthusiasts. We listened as they told story after story about their favourite local wines, the winemakers, and the development of the Wairarapa wine industry. As dusk turned to dark, our conversation turned to food. We had exhausted our supply of local delicacies during the wine discussions, but I remembered the promise of excellent fish and chips made earlier in the day . . . my stomach growled. Unbeknownst to us, one of the men (Bill) had ordered a heaping supply of fish and chips from the hotel and had it delivered to our camper van! Amazing. With food in hand, a driftwood fire glowing, and good company in our midst, we spent the rest of the evening exchanging stories: about the places we loved, the people we’d met, the fish that had been caught, and those that gotten away. Thanks for the great visit Wairarapa . . . we’ll be back.